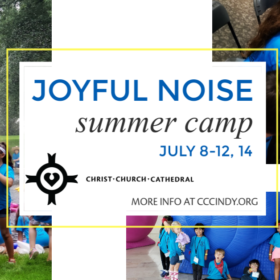 Music at Christ Church Cathedral has long played a pivotal role in connecting choristers and congregants to each other, to the church’s history, to the Episcopalian tradition, and to God. Here, music is a gateway to the rhythm of our congregation. Our choristers are the young and the young-at-heart, the seasoned amateurs and the music professionals. But they have one thing in common—a love of singing. The Christ Church Cathedral choirs have sung on the steps of the Soldiers’ and Sailors’ Monument and in the halls of Westminster Abbey. They use music as a bridge between different cultures, beliefs, and languages and provide educational, travel, and personal development opportunities for children and families. Contact Michael Boney to learn more about the choirs and how to participate. Founded in 1883, this choir enlists voices from numerous schools and religious backgrounds. The choristers receive weekly vocal and music theory instruction, as well as training in sight singing and musicianship. Our Coro Latinoamericano was founded in 2000, in response to Christ Church Cathedral’s growing number of Hispanic parishioners. The choir leads the 1 p.m. Santa Misa Sunday service and combines Anglican tradition with Latino music and culture. This mixed-voice choir sings two Sundays each month, and unites with the Coro Hispano and Choir of Men & Choristers for special occasions. The Gallery Choir was founded in 2016, and is open by audition to anyone who loves to sing. 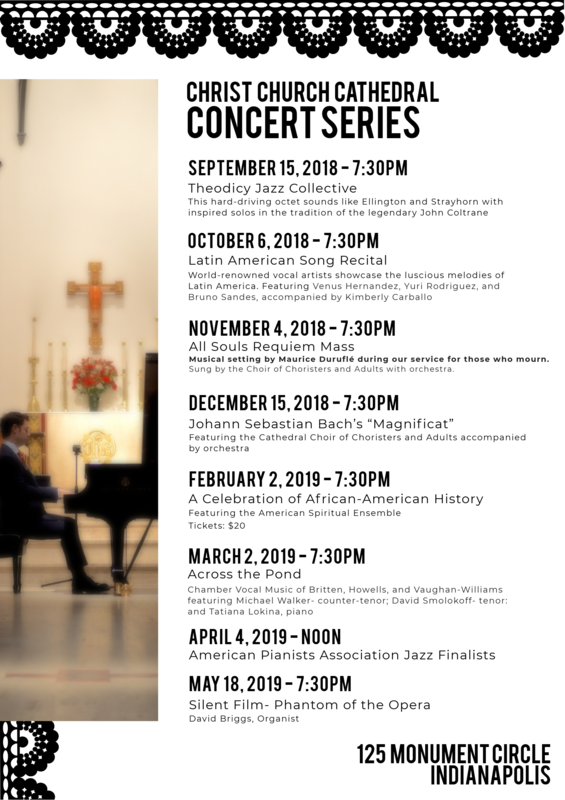 We’ve just announced our 2018-2019 Concert Series! Printable (PDF) version here. 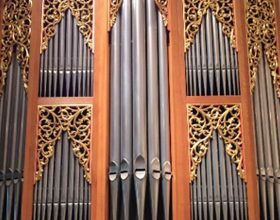 A Hellmuth Wolff & Associates organ with more than 3,000 pipes. 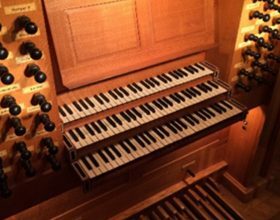 Dedicated in 1990, this organ was designed to handle the colorful French organ tradition and accompany the CCC choirs for traditional Anglican choral music. Visually, it complements the beauty of a stained glass window. 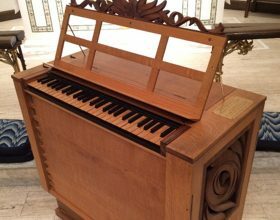 This 1992 Taylor & Boody Organbuilders gallery organ provides congregational support for hymn-singing and service music. It is ideal for North German Baroque repertoire and provides choristers and musicians with the flexibility to perform in either the upper or lower galleries. A modern organ based on a variety of historic instruments. Dedicated in 1996, this John Brombaugh & Associates instrument can accommodate the various musical needs of contemporary performers.